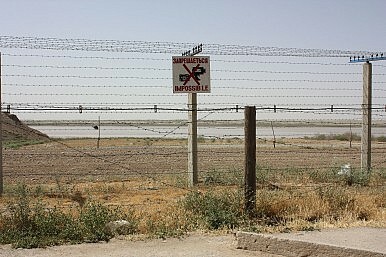 A fence further down the Amu Darya, where it divides Uzbekistan from Afghanistan near the Uzbek city of Termiz. To steal a line from Shakespeare: Turkmenistan doth protest too much, methinks. According to RFE/RL on October 23, several dozen Taliban militants were chased onto an island in the Amu Darya by Afghan forces. The day before, Afghan Vice President Abdul Rashid Dostum personally launched an operation in the northern Afghan province of Jawzjan. The Amu Darya, which forms part of the border between Afghanistan and Tajikistan has been moving southward over time, with summer seasonal floods destroying farmland as the river erodes Afghan territory. In addition, islands of questionable sovereignty dot the river–and it was to one of these islands the Taliban have reportedly fled. TOLOnews reported that according to Dostum, the Afghan forces have been in contact with Turkmenistan’s border forces and the two will coordinate to dislodge the militants on the island. According to RFE/RL, Dostum’s spokesman, Sultan Faizi, said the Afghans did not move into the river in pursuit of the Taliban to make sure they did not enter Turkmenistan’s territory. Ashgabat is prickly about the border and has engaged in a two-faced narrative. State media has not reported about previous cross-border incidents–including the deaths of three Turkmen border guards last year and arrests of Afghans caught grazing their livestock on the Turkmen side. Meanwhile Turkmenistan has made subtle international overtures for help, all the while erecting fences and digging ditches along the border. A Taliban spokesman, according to RFE/RL, said their fighters were not marooned in the island, but were staging themselves on the Afghan side of the island. Turkmenistan had a generally positive relationship with the Taliban when it was in power in Kabul, but Ashgabat also tacitly supported the U.S. invasion. Over the years, Turkmenistan’s strategy to manage the border has deteriorated as new militants moved into the area and the river ate up Afghan territory. Turkmenistan, which neglected its military as a function of its declared neutrality, has been beefing up its military capabilities in recent months. Muhammad Tahir, director of RFE/RL’s Turkmen service, pointed out a few weeks ago that having done away with essentially all internal sources of opposition long ago, this strengthening be interpreted as a response to the crisis in Afghanistan. According to some reports, Turkmenistan has moved as much as 70 percent of its military forces to the Afghan border. It’s unclear if Dostum is right and the Afghan forces are actually coordinating with Turkmenistan to dislodge the Taliban from the island. As Bruce Pannier pointed out, it seems the Afghans have at least laid out the rhetorical groundwork for a solo mission, saying the island is divided between Afghanistan and Turkmenistan. Could TAPI Bring Peace to Afghanistan? If history is any indication, no.